Ultra Quest > Quest Triple Thermostatic Shower Valve, Head & Shower Kit. Quest triple concealed thermostatic shower valve set in chrome. 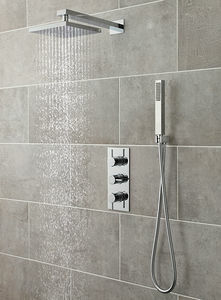 Square fixed shower head, arm and shower kit. Square fixed shower head and wall mounting arm. Square outlet elbow with parking bracket, hose and handset.